When I first came across the tiny canal cottage, I fell head over heels in love... 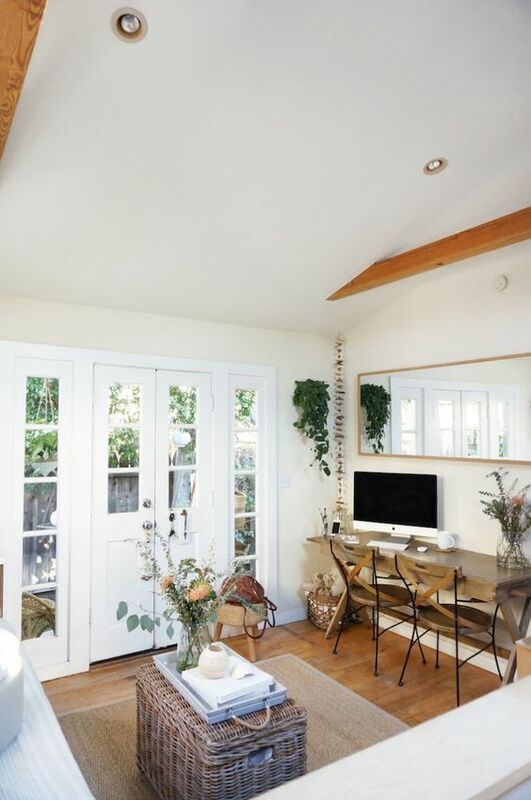 This 362 square foot home is tucked inside the quiet, artistic streets of Venice, California and is home to Whitney Leigh Morris and Adam Morris, along with their two pups and baby boy, West. Filled with natural light, neutral colors, and an indoor-outdoor lifestyle, this home feels anything but small. The minimal decor and pops of fresh greenery help in this too. Whitney and Adam have noted that they have to be mindful of what they allow into their home as it can quickly become over cluttered. 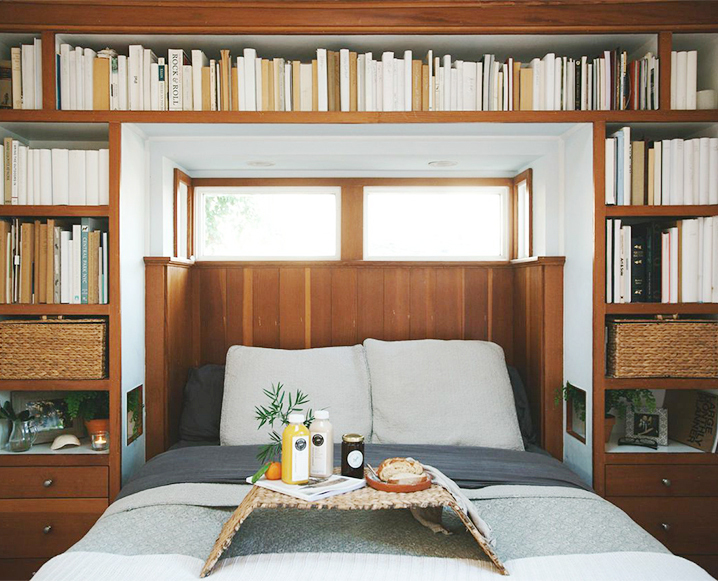 By only having what they use and love, they are able to make their small space work. Whitney's motto is that: you don't have to live large to live beautifully. Downsizing their possessions was the first step Whitney and Adam took when moving into the tiny canal cottage. Being their first time living together, they worked to consolidate their possessions and donated the excess. Adam "had a storage unit, and I had boxes of things leftover from a previous relationship and living situation, so we went through all of the items and got rid of the majority of them. Everything we own is right here. In fact, we actually have FAR less now (even after having baby West) than we did when we first moved in. Its liberating" (Yonker). After de-cluttering and got rid of the excess Whitney and Adam didn't rush to fill their home back up but took their time, choosing to get to know the space and how they would end up using it. Everything that was brought in was chosen deliberately. You can read more about their journey in small space living here and here. Suzanne Hall. 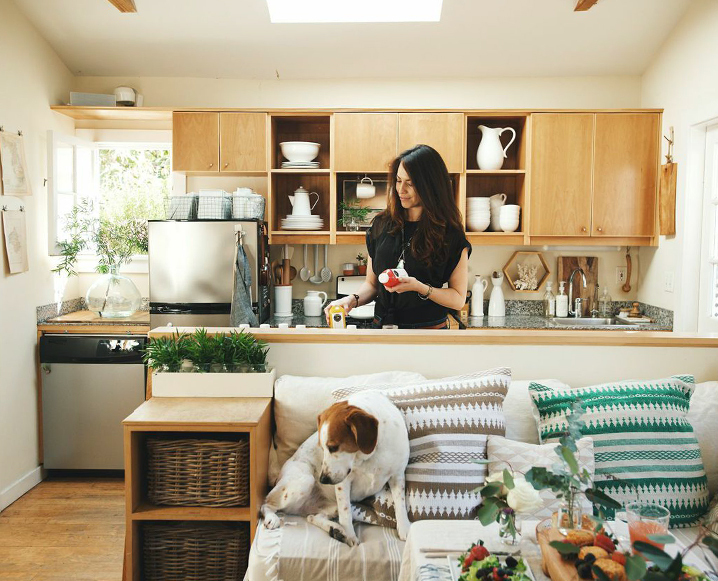 Small Space, Big Style: Brunch at Home With a Venice Designer. The Chalk Board Magazine. 2015. Photo Credit: Yayo Ahumada. Abigail Yonker. Tour the 362 Sq. Ft. Venice Cottage of a Creative Young Family. The Everygirl. 2017.